Technology companies have long been admired for their leadership in innovations. But they have lagged in the social responsibility department, especially in diversity employment. In 2013, Tracy Chou, then a software engineer at Pinterest, challenged tech firms to release the numbers of their women and minority employees. 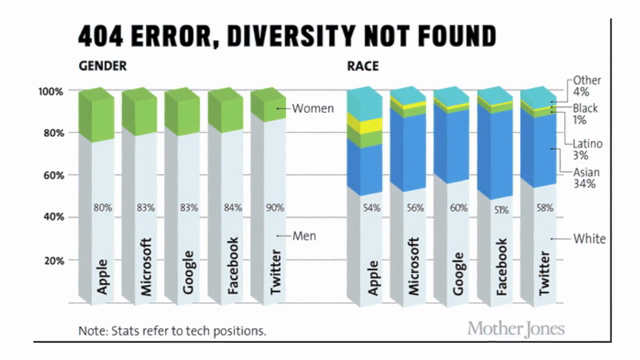 The following year, many of the biggest companies, including Apple, Facebook, and Google, publicly released the percentage of their female, black, Hispanic, and other underrepresented minorities employees for the first time. The numbers were not good. The good news today is that tech companies are now applying their formidable analytic skills to the issue in a more in-depth way than simply reporting numbers. This year, Pinterest and Twitter are focusing on hiring goals in their reports rather than reporting just the racial and gender breakdown of their employees. They are also evaluating their hiring practices to improve recruiting. Their reports are due out later this month and Tracy Chou will be watching: she is now part of Project Include, an initiative to measure and increase diversity in tech. I’m John Howell for 3BL.